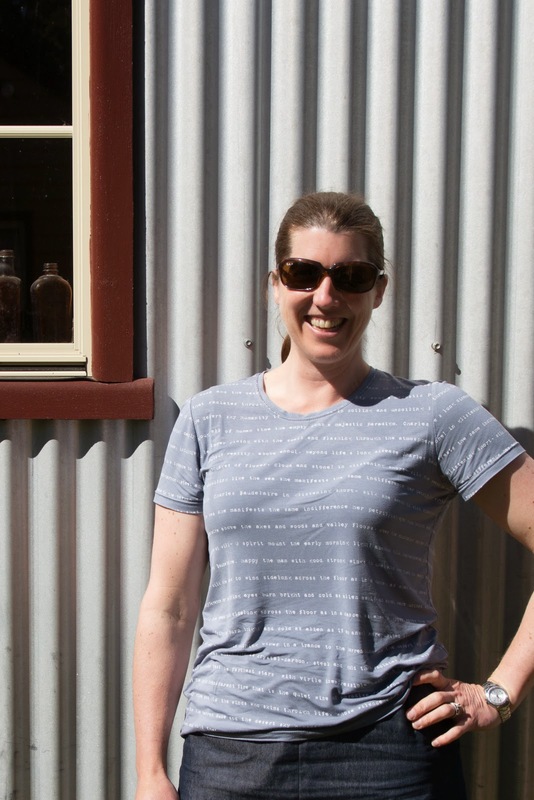 When I was busy making Flipper's Father's day T-shirt, I figured with the pattern instructions out and the overlocker threaded with grey, it was probably the right time to make the Liesl & Co Women's Metro t-shirt for me! Mine's a straight XL (oh that hurts to type, but it's the truth). I measured between the L and XL and followed the pattern's advice to size up a little. Also, this fabric is a pretty thin viscose jersey and would be very underwear ugly if it was too clingy. The size turned out perfect. the shoulders sit right, the armholes and sleeves are not too big, but there's plenty of freedom and swing throughout the T-shirt to avoid any tightness or lumpy bits. 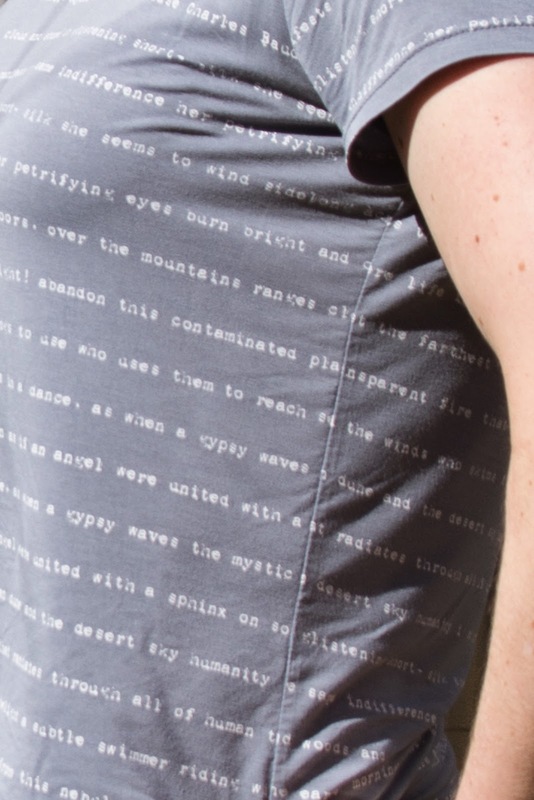 Just showing off my side seam matching, but also having a laugh as the written words make as much sense when you read over the seam as anywhere else. I have to admit to ignorance and say I don't know if it's a famous poem or just a fairly random collection of words. There's a reference to Baudelaire thrown in, just below my neckband are the words "empty womb" and my left breast bears the word "ennui". All sounds about right! I think there might be enough leftover to make a T-shirt for one of the kids, which would put me on theme with the upcoming Kid's Clothes Week. I kind of like the idea as the print itself seems somewhat inappropriate for a little kid, but is in a very appropriate storybook style font! It reminds me of a book of poetry that I have which includes some translations of Villon, a very ribald poet. How my son would love a T-shirt with a quote about "a fart such as no toxic beetle ever puffed forth". 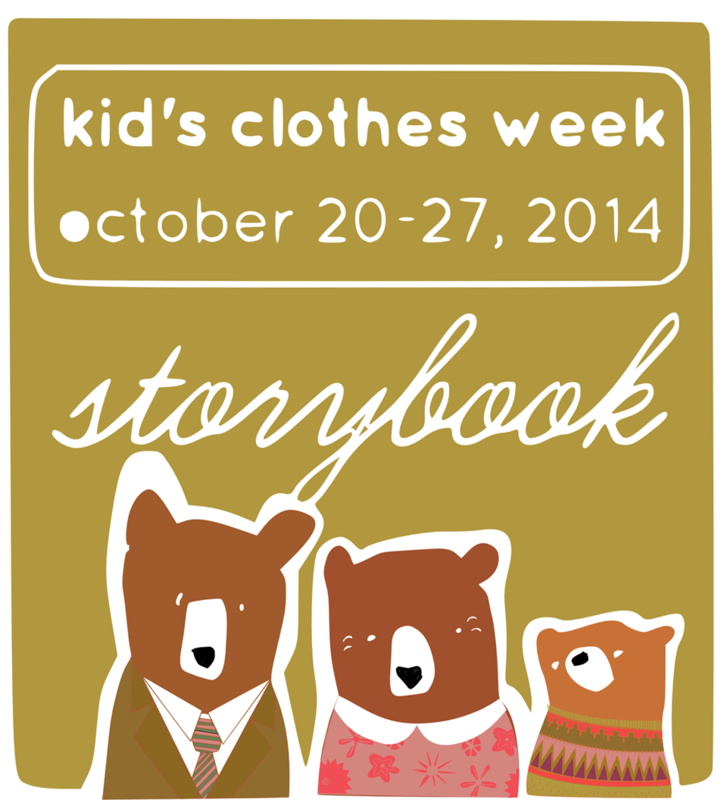 What does the theme Storybook suggest to you? Such a perfect fit...it looks great! And it sounds like you're one of those people who actually change their serger threads to match their project. I'll shamefully tell you that I just use gray serger thread for everything. Rethreading that thing is the bane of my existence! Thanks Carolyn. When I first got my overlocker I kept pulling the threads at the end of stitching as you might with a sewing machine. That would unhook one of the looper threads and I'd have to rethread it. I got so much practice that first weekend that I can do it on autopilot now and will happily switch thread colours whenever I need to! You got a great fit and I love the idea of a tee for one of the littles. Is Missy A sounding out yet? Oh Nicole,. there's nothing I hate more than lumpy t-shirts. Even when I was a lot leaner I would still refuse to buy thin knit tops that showed bra lines. Now, with extra lumpiness I'm even fussier! A had her 3.5 year old maternal health care nurse check recently and she was hilarious. She put on the performance of her life (I thought she might refuse to play along at all). For the eye sight test she was meant to point to the letters that matched the ones held up by the nurse. She just read them aloud and then told the nurse words that started with that letter! Little smarty pants! Cute, Shelley! And look at those matching stripes!